Aside from looking unusually classy for an orphanage, this underutilized video game setting gives the game an unsurprising dark humor tone. This is further enhanced by the almost calming mood by the light purple environmental lighting filling nearly each room. It's a curious and pleasing hue where you can't tell if the brightness is coming from extreme moonlight or if the day is about to break. And these beams of light do a lot in exposing the floating dust and debris, a visual effect not that all dissimilar in how dust was showcased in Dead Space 2. 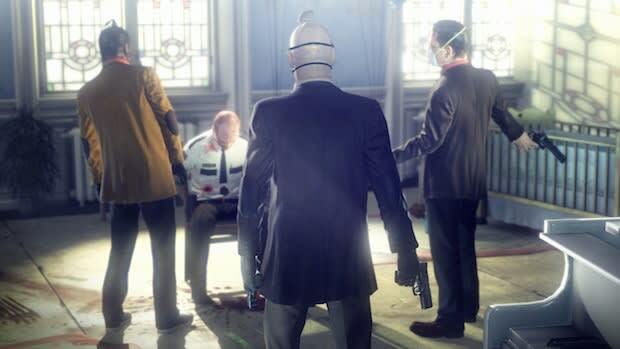 And while surface-sensitive footstep sound effects aren’t anything new in 2012, it's still nonetheless pleasing to hear, especially when Agent 47 goes from walking on a chapel carpet and transitioning to hardwood floors. In an era where videogame interfaces seem to veer toward minimalist HUDs, it's almost refreshing that IO Interactive is comfortable in having an info-filled, yet practical interface. Along with the radar, there's no way you can ignore the enemy AI awareness status. These color-coded bars appear boldly on top of the screen like some Homeland Security threat level advisory system. It's clearly spelled out what the awareness status is, whether it's "Curious", "Clear", and "Exposed" just as examples.